The “Wednesday revolutions” organized via social networks and conducted in Minsk and other regional towns are making the Belarusian authorities nervous. At a superficial level, there’s no immediate cause for their anxiety; the people gathering in the center of their towns each Wednesday are simply applauding without any explicit political or economic demands. The meetings have the appearance of a flash mob, with the entire crowd “spontaneously” erupting in applause. But any public demonstrations are dangerous for the regime, which many are blaming for the economic crisis that is leaving many citizens struggling to support themselves. But it’s not the crowds themselves that spark the greatest fear in the authorities—it’s the fear that they might spread. The demonstrations have attracted the attention of those who have not heard about the Wednesday actions, and of those who have heard but were afraid to join. Indeed, the mass applause is the best proof that those unsatisfied with Lukashenka’s regime are not the marginal minority state TV stubbornly claims they are. The number of participants in the demonstrations has grown from between 1,000 and 2,000 two Wednesdays ago to approximately 5,000 in Minsk and up to 700 people in the country’s second largest city, Homiel, on June 22. Now, even smaller towns have been marked as featuring these “revolutions of applause,” as seen below on the map created by the Belarusian newspaper Nasha Niva. The authorities seem to be sufficiently afraid of the peaceful flash mob that they have ordered the harsh dissemination of the crowd. 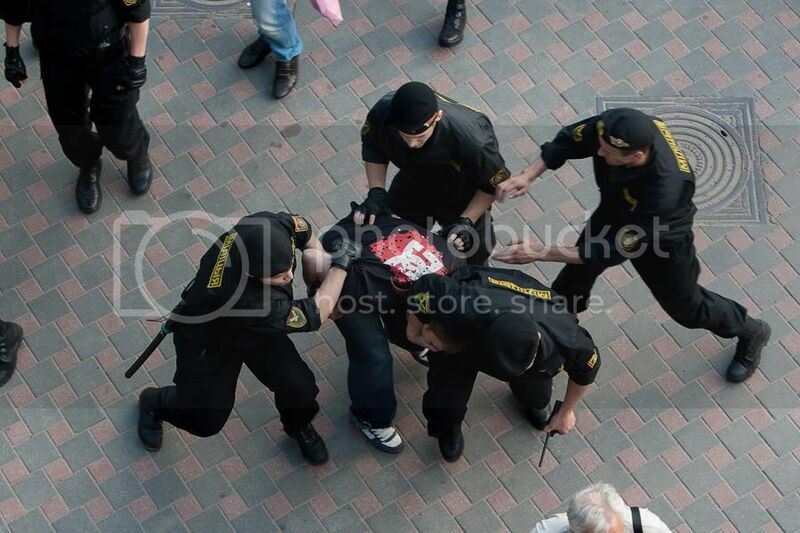 More than 400 people had been detained throughout the country, 200 of them in Minsk. 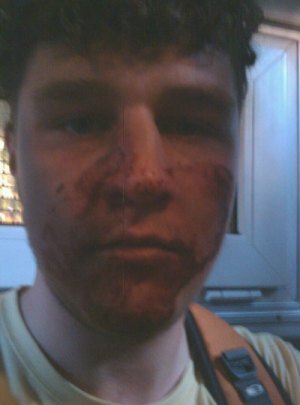 Some detained youth claim that they have been severely beaten while detained. Illa Pietraviec (below) is among them. He managed to take his photo in the detention car and to upload it on Twitter. 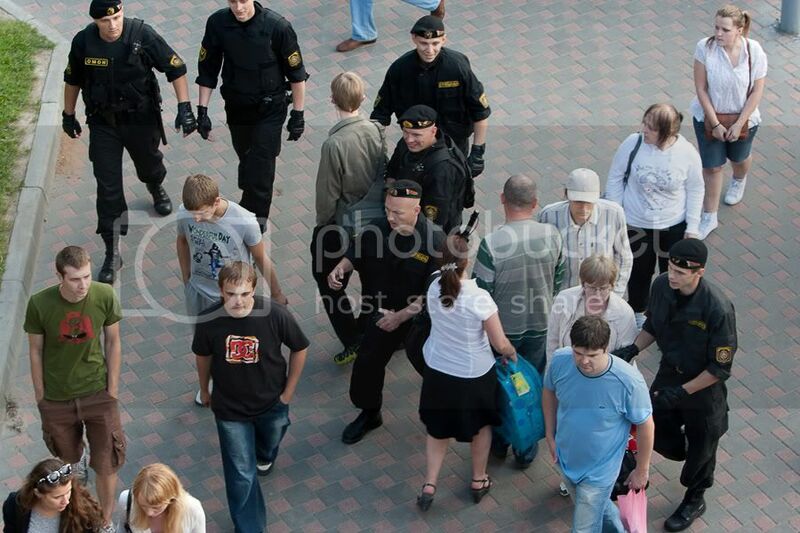 As most youth have had no flags or party symbols whatsoever, the militia appears to be arresting people at random, as documented in the sequence of images below, captured by Anton Matolka. 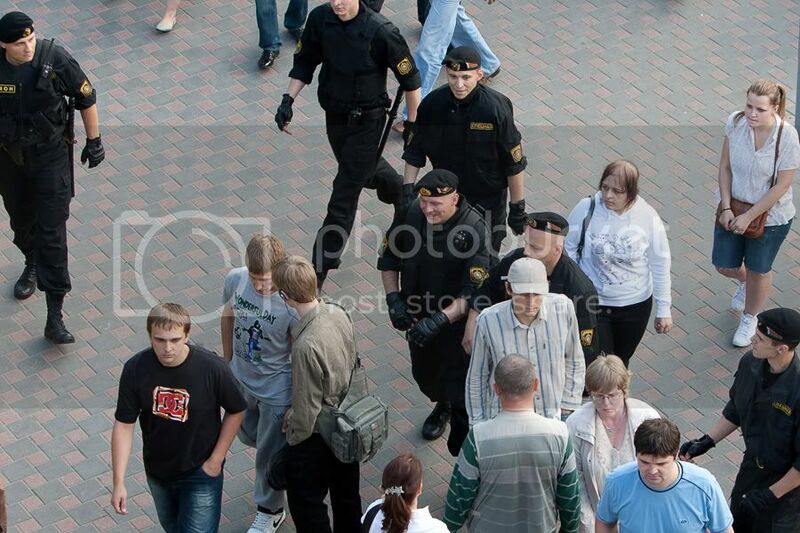 Some witnesses were detained by the OMON (the special force mostly used for demonstration pacification) on the stairs to the Catholic Kasciol (Church) in the Square of Freedom. One witness told me that the OMON soldiers had been trying to take individuals; only the protection of others permitted those held near the church to leave of their own will. The witness also recalls the derogative speech the OMON soldiers had been using to address girls right next to the church, calling them prostitutes and idiots. Civilian documentation through videos uploaded on youtube and participation in social networks, among other forums, are attracting an increasing amount of attention. One such video documents the crowds gathering in Minsk and ends with a woman being shoved into a police car by the policemen. Uploaded yesterday, it had already received over 11,000 views at the time this post was published. Those arrested were taken to the court and fined approximately 200 USD. This time no one has been detained for a significant period of time—maybe the authorities have realized that fines, not detention periods, are more useful to them in the economic crisis. Last Friday and Saturday the “revolution” communities organized through the social networks reported that they have collected 6,000,000 BYB, or 1,000 USD, to cover fines for participants who were arrested for their applause. Human rights organizations have also launched similar calls so that no one will be left abandoned. The demonstrations organized through the social networks have been acknowledged by state television, which has called the participants a “couple hundred drunk youth without any brains”. Mihalchanka, a TV anchor who is on the EU’s visa ban list, has attacked the Wednesday youth in the same words. However, the authorities are very much aware of the danger the demonstrations are bringing them: This Wednesday they are planning to organize a disco for the pro-governmental Belarusian Patrotic Youth organization members right in the Cetral Kastrycnickaja Plosca (October Square) where the opposition youth usually assemble. The same order had been given to the local authorities in other towns. The climax of these events is expected to fall on July 3, the day Lukashenka’s government has designated as Independence Day. There are multiple calls in the social networks to protest it in different forms, either through mass applauding or by other means.